If the Grande 10 towel warmer from WarmlyYours proves anything, it's that sometimes huge performance comes in small packages. It's heat output of 460 BTUs per hour stands toe-to-toe with many larger models, while its compact profile means the Grande 10 can be installed in a variety of locations. The flat bars of the Grande 10 provide ample surface area to heat and dry your towels and bathrobes. The spacing of the bars also incorporates a specialized top-bar pairing for hand towels. This wall-mounted model features a hardwired electrical connection (110 120 VAC), discrete power switch, 304-stainless steel construction, and brushed finish. Your lifestyle will turn into constant comfort and convenience thanks to the Ancona Svelte Rounded Brushed Wall Mounted Hard Wire Electric Towel Warmer and Drying Rack. The meticulous design provides 13 racks for luxuriously warm towels after showering, as well as drying them after use, keeping them fresh between laundering. The Svelte Rounded Hard Wire includes the additional feature of a 24 hour 7-day digital timer which is great for energy savings and security. The hard wire mount plate discreetly conceals the wire to flawless fit to your decor. Gorgeous in bathrooms and full of possibilities for laundry room, exercise room or mudroom - it's a sure upgrade to make life better. 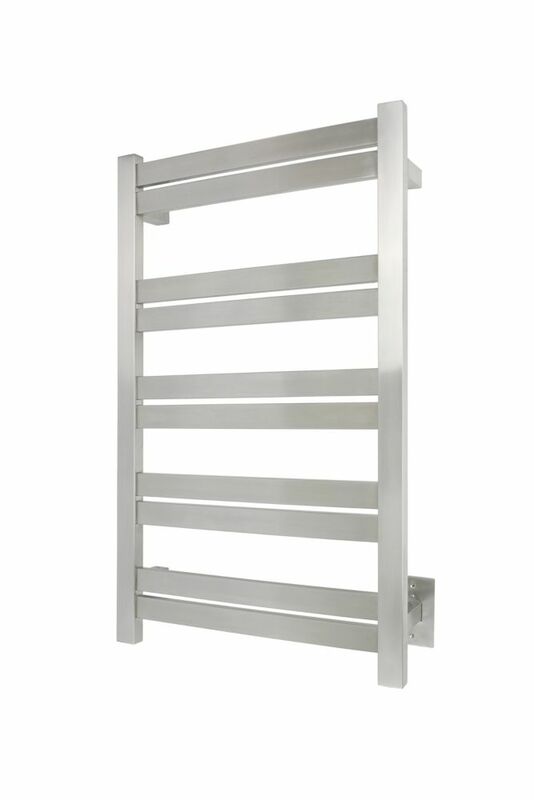 WarmlyYours Barcelona towel warmer is manufactured with a flawless brushed stainless steel finish to ensure lasting beauty and durability. Free standing so you have flexibility in placing it anywhere you want. Imagine your homes master or guest bathroom with this beautiful, functional accessory. Including this towel warmer as a comfort element of your bathroom design can help you create that tranquil and relaxing spa atmosphere you have always dreamed about. Grande 10 Towel Warmer, Brushed, Hardwired, 10 bars If the Grande 10 towel warmer from WarmlyYours proves anything, it's that sometimes huge performance comes in small packages. It's heat output of 460 BTUs per hour stands toe-to-toe with many larger models, while its compact profile means the Grande 10 can be installed in a variety of locations. The flat bars of the Grande 10 provide ample surface area to heat and dry your towels and bathrobes. The spacing of the bars also incorporates a specialized top-bar pairing for hand towels. This wall-mounted model features a hardwired electrical connection (110 120 VAC), discrete power switch, 304-stainless steel construction, and brushed finish.